The two pioneer leaders of our ministry recently handed over leadership. Rev. Vincent Modiko, our pioneer Board Chairman whose tenure ended last year, and brother Sam Kputu, our pioneer National director who has been nominated as the International Director for CAPRO. 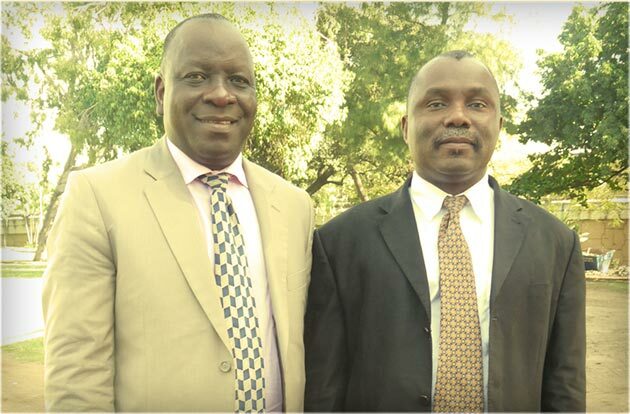 During our National Board meeting in February, Prof. Seyi Amosun and brother Chim Onyebilanma were appointed as the new Board Chairman and National Director for CAPRO Missions SA, respectively. Prof. Amosun, who has been involved with CAPRO for several decades internationally and has served as board member of CAPRO SA from the outset, is a professor of Physiotherapy at the University of Cape Town. Brother Chim has been serving with CAPRO SA since 2007 as the Director for Mobilisation and Media. Before joining CAPRO SA he served as the National Director for CAPRO Togo, in West Africa, for the previous 8 years. He and his wife, Ibi, pioneered our KZN work and are based in Waterfall, near Durban with their 5 children. Chim will continue to operate from our base in Durban area. Only GOD makes such great choices! Congratulations to Sam, Prof. & Chim. May your single eyes behold a great GOD for eternal accomplishments in JESUS! I have know both these men in recent years. They have impacted my life in an uncommon way. They represent Christ well – a workmanship created in Christ unto good works. Congratulations to you. TO GOD BE THE GLORY GREAT THINGS HE HAS DONE…..
We thank the Almighty for how has led His children in doing His work. We say welcome back to Bro. Sam and our Sister Roli and to Chim and Ibidun may the Lord strenghten you for the task ahead . Congratulations! It is the Lord’s doing. May He continue to strengthen you all for His good works. Praise God for what He is doing through all of you in SA Team. You have bben courageous and God has been faithful to help you see the fruit of your labors. To Amosun and Chim, we pray and trust that through you SA shall bring forth men of vision that will reach out to the unreached nations. We bless the Lord for His goodness and mercies over you all in the SA team. May the Lord who calls and enables continue to empower you to raise the seeds of righteousness that will possess the earth for our God’s glory. May the Lord encourage you and give you fresh grace, anointing and the strength for the journey ahead as you lead the team to greater heights under the Chief Shepherd Himself – our Lord Jesus Christ. God bless and congratulations. Thank God for Brother Sam and his selfless work in SA. I pray that God’s abundant wisdom will be with him in his new posting. Thank God for raising another leader who has the same spirit of total dedication and relentless service as Bro Chim. Like Elisha, I pray that God will give you, Bro Chim, double portion anointing for the works ahead. Knowing Bro Sam as i do, I know he is praying the same prayer for you. I also want to congratulate Prof. (my old Choir Master at Oritamefa Baptist Church) on his new appointment. Through your primary School in Ibadan, you sponsored my children’s education for five years. Your love for God is exceptional. This has given me the assurance that Capro SA is in safe hands. I thank God for His infinite mercy and wisdom . congratulation dad, your a great instrument in the hand of Jésus in Afrique. my prayer is to resemble you in your faith, your comitment to the task of haven. Bro Sam, you inspire me deeply from a distance. I admire your devotion to our Great King, i admire your sharp mind and creativity and versatility. I pray in your new responsibilty as CAPRO ID you will find Christ’s grace breaking forth upon you in new and fresh dimensions you have never yet experienced. Hi Chim, am confident in God that the double portion of Sam’s annointing will rest upon you. You will, by His grace, do double or more of what God used Sam to do. Remain strong! our love you all, your families and team mates.